Emmy and Oliver were going to be best friends forever, or maybe even more, before their futures were ripped apart. In Emmy's soul, despite the space and time between them, their connection has never been severed. But is their story still written in the stars? Or are their hearts like the pieces of two different puzzles—impossible to fit together? Emmy just wants to be in charge of her own life. . . . She wants to stay out late, surf her favorite beach—go anywhere without her parents' relentless worrying. But Emmy's parents can't seem to let her grow up—not since the day Oliver disappeared. Oliver needs a moment to figure out his heart. . . . He'd thought, all these years, that his dad was the good guy. He never knew that it was his father who had kidnapped him and kept him on the run. Discovering it, and finding himself returned to his old hometown, all at once, has his heart racing, and his thoughts swirling. Readers who love Sarah Dessen will devour these pages with hearts in throats as Emmy and Oliver struggle to face the messy, confusing consequences of Oliver's father's crime. Full of romance, coming-of-age emotion, and heartache, these two equally compelling characters create an unforgettable story. Another adorable read from Robin Benway! If there’s anything you’re going to take away from this book, or a few other Robin Benway books, is that family is number one. Always. (I really hope most of you can relate to that, because if not, it really breaks my heart). Many times, and I’m talking about most of this book, I wanted to get up and go hug my parents or my brother. The sense of familial warmth seeped out of this book. Out of Emmy and Oliver’s families. That this books emotional level was so real and down to earth that I couldn’t help but get choked up. This isn’t your regular best-friends-fall-for-each-other type of romance. It has a small twist. And when I say small twist, I mean one of our best friends was kidnapped by his father when he was younger and isn’t found until 10 years later. Yeah, not your average YA novel, eh? And I was expecting so much! I was ready to be blown away and dig into this kidnapping scenario. Oliver coming back and his submersion into high school was heavily blanketed by Emmy’s minor issues. Like, a boy has just returned home to his mother who hasn’t seen him in 10 years and you’re complaining about how your parents are too protective of you?! Appreciate the family you have, girl!! (Yeah, I may have over thought this, but it irritated me nonetheless). The kidnapping fell in second to the romance, but I’m okay with that. I still appreciated this book. It was extremely cute and, as always, hilarious! I will always expect simultaneously grinning and crying in any one of Robin Benway’s books. They are seriously so adorable! Emmy & Oliver is going to be the book to impact you right where it matters. A book about all sorts of relationships that really hits close to home for most of us (minus the kidnapping). When they were seven-years-old, Emmy and Oliver were best friends. Then Oliver’s dad kidnapped him and he wasn’t heard from for ten years. Now, at seventeen, Oliver is returning home. So much has changed in the ten years he’s been gone and he has to struggle to fit in. Emmy is excited for her friend to finally come home. She’s grown up being overprotective parents and has been lying to them about surfing and wanting to go away for school. Oliver’s return isn’t easy but Emmy is determined to make it right. This book ended up being a lot lighter than I thought based on the premise. It really was a roller coaster of emotions while reading, up and down, up and up and huge down, laughing, squealing, gasping, crying, laughing again. It was a lot of fun. The book was told through Emmy’s POV and I really enjoyed her voice. It was clear that she was affected by Oliver’s disappearance but also trying to live her own life so many years later without having forgotten him. She had a great sense of humour that had me giggling at a lot of her comments and she just seemed like the type of character a reader could be friends with. I loved the dynamic between her and her two best friends, Drew and Caroline, and how it changed when Oliver returned. There was definite chemistry between Emmy and Oliver. It could have easily stayed a friendship and I would have been happy with that but it was nice to see them both leaning on each other and getting to know each other all over again. Oliver could open up to Emmy about how he was really feeling about being back, all the media attention, his fear of hurting his mother by not hating his dad. Emmy could tell Oliver her secrets like applying for college, surfing, her fear that her parents would never let her leave. Throw in more drama with Drew and Caroline, and I was loving it. Caroline was the youngest in a huge family and her parents basically ignored her. Drew’s parents seemed more concerned with money than accepting their son. The friendship between these four was a huge highlight. It was one of those rare books where I didn’t dislike any of the main characters. I really liked that the author showed Oliver’s return wasn’t easy. He couldn’t just slide back into town like he hadn’t been gone for ten years. Parents became protective over their children and with some it wore off after a while and with some it stayed. Oliver had to leave everything behind for a second time and start over. He somehow had to reconcile the image of his dad raising him and loving him with being a criminal. It wasn’t easy on anyone. The plot flowed really well. It made for an easy and fun read. It could go from serious to playful in an instant without it feeling abrupt, which was nice since that meant I stayed absorbed in the story. I thought the ending was really great, very touching and realistic, and I was so happy with how the whole book turned out. When they were seven-years-old, Emmy and Oliver were best friends. Then Oliver's dad kidnapped him and he wasn't heard from for ten years. Now, at seventeen, Oliver is returning home. So much has changed in the ten years he's been gone and he has to struggle to fit in. Emmy is excited for her friend to finally come home. She's grown up being overprotective parents and has been lying to them about surfing and wanting to go away for school. Oliver's return isn't easy but Emmy is determined to make it right. The book was told through Emmy's POV and I really enjoyed her voice. It was clear that she was affected by Oliver's disappearance but also trying to live her own life so many years later without having forgotten him. She had a great sense of humour that had me giggling at a lot of her comments and she just seemed like the type of character a reader could be friends with. I loved the dynamic between her and her two best friends, Drew and Caroline, and how it changed when Oliver returned. There was definite chemistry between Emmy and Oliver. It could have easily stayed a friendship and I would have been happy with that but it was nice to see them both leaning on each other and getting to know each other all over again. Oliver could open up to Emmy about how he was really feeling about being back, all the media attention, his fear of hurting his mother by not hating his dad. Emmy could tell Oliver her secrets like applying for college, surfing, her fear that her parents would never let her leave. Throw in more drama with Drew and Caroline, and I was loving it. Caroline was the youngest in a huge family and her parents basically ignored her. Drew's parents seemed more concerned with money than accepting their son. The friendship between these four was a huge highlight. It was one of those rare books where I didn't dislike any of the main characters. I really liked that the author showed Oliver's return wasn't easy. He couldn't just slide back into town like he hadn't been gone for ten years. Parents became protective over their children and with some it wore off after a while and with some it stayed. Oliver had to leave everything behind for a second time and start over. He somehow had to reconcile the image of his dad raising him and loving him with being a criminal. It wasn't easy on anyone. Great premise and loved the characters of Emmy and Oliver. I got an ARC of Emmy & Oliver from The Regulator Bookshop in February. I saw it and was immediately intrigued. I picked it up once I got home and liked it right off the bat. Emmy & Oliver is unlike other books I've read. It deals with things that YA books often don't and manages to be happy despite hard situations. Emmy is awesome. That said, I have a feeling things would be a tad easier if she just told her parents things. Her parents practically wrap her in bubblewrap, which is horrible, but I think they would start treating her more like and adult if she showed them that she was. I still want to slap her parents a couple times though. I really like Oliver too. He's complex and has issues without being whiny. Oliver was kidnapped by his dad as a kid, and hadn't even realized it. He comes back at the beginning of the story and it's obviously a rough transition. Still, he manages to come back into the fold and figure out life. Also, Emmy and Oliver are the cutest ever. I've tried to read a couple other Robin Benway books and haven't been able to really get into them, but this sucked me in immediately. 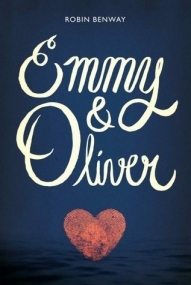 Emmy & Oliver is a face paced book that is both fun and mysterious! The book takes place in California, a place I love to read books in. It's interesting seeing their world develop and take shape as Emmy and Oliver figure out their places in life. Emmy has been fairly comfortable in her place, but with graduation coming, as well as Oliver coming back, she's forced to change her views, and thus change her world.